 Home › Politics News › Tinubu Orders Gov. AMBODE To Quit : He Says "NO"
Tinubu Orders Gov. AMBODE To Quit : He Says "NO"
and APC jagaban, Asiwaju Tinubu. 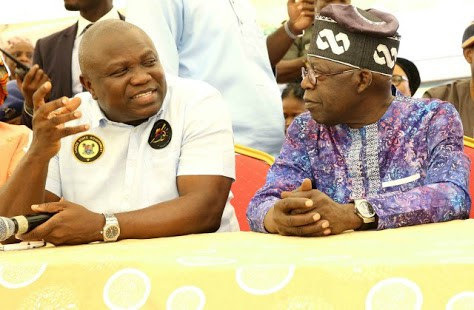 .The battle on who gets the governorship ticket of the APC in Lagos continued on Wednesday with the party leadership mounting pressure on the incumbent Governor Akinwunmi Ambode, to close chapter on his second term bid and endorse Bola Tinubu's man, Babajide Sanwo-Olu. HOW IS THAT POSSIBLE AYNAIJANG READERS? Sanwo-Olu, a former commissioner in the state, on Sunday formally declared his intention to vie for the Lagos State governorship ticket of the APC, promising to restore the glory of the state if voted in as the governor. The Punch learnt that both the state and national leaders of the party met on Wednesday and mounted pressure on the Lagos governor to accept the decision of the state APC leaders. The Punch also learnt that Ambode had instructed his camp not to speak to any journalist and wait for the electoral process to pan out.